Yaaaaaas!!! Get your sample before it runs out (again)! 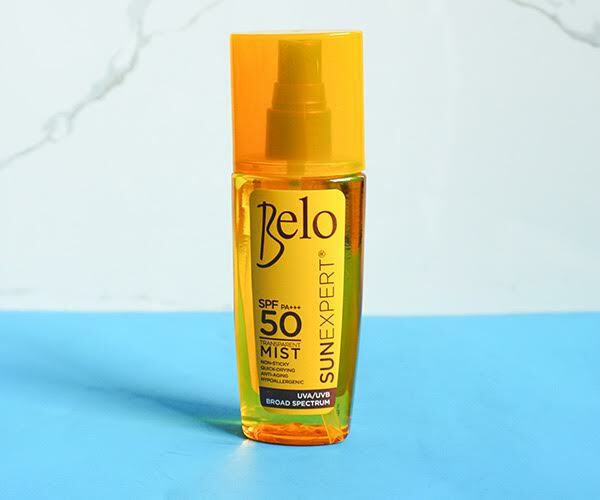 Belo's Sunexpert SPF50 Transparent Mist is back! And last summer, the samples on Sample Room literally flew off the shelves. This is a popular product as it's very unique in formulation and format. There have long been sunscreens in spray format, but usually the actual product is still a lotion. Usually it's just thinner or runnier to be able to be sprayed. This one is a dry oil kind of spray. For those who do not like the sticky feel associated with lotions, this is for you. The dry oil format, for me, is good in the sense that this stays put quite well during water sports. I find it to be quickly absorbed by skin, too, so there's no required lag time between application and sun exposure. Personally, I find this to actually be less lightweight in feel compared to the lotions of Belo Sun (although the whole range is lightweight), which is why I prefer to use this for water sports. I prefer to use the creams for everyday. Nicole Hernandez shared that this is her favorite because it sprays at any angle. What this just means is that when she's on an outing with her kids, before they can even whine, she has already successfully applied sunscreen on them! She shared at an event that when her kids would try to run, she can easily spray the product onto them as they are running. Unlike competitor sunscreen sprays that can only be administered when the bottle is in a certain angle, this is the ultimate weapon against child sunburns. We all know how fussy kids can get when it comes to sunscreen, so this is a great help. To add, since there's no required waiting time, kids will not bore to death as they can immediately enjoy the outdoors right after application! Be sure to try this today! This retails for Php479.75 for a 100mL bottle, available in leading department stores nationwide. I personally am so enamored with Belo Sun as the whole range is so lightweight. The whole brand is perfect for everyday, and perfect for the Philippine climate. They really put the hot weather into consideration with their product line, which is why the products do not feel uncomfortable to use, especially during the summer.